The Injector syringes dispense sealant with total accuracy, eliminating concerns over under-dosing or over-dosing. The screw attachment works on all valve stems and avoids leakages. The Injector is a product that can be used with any of our sealants, or lubes and other liquids used in the workshop (subject to the user cleaning the unit thoroughly as recommended). Once purchased, it will have a long lifetime of use for successive tyres. NEW, UNIQUE 150ml/5 oz. 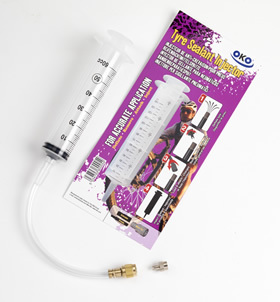 calibrated syringe for bicycles, motorbikes, quads, caravans, trailers, cars etc. Both with flexible dispensing tube and double-thread screw end for clean Presta or Schräder injection. Better value than any competitor product. Includes a valve core remover tool. Plastic medical-grade syringe with removable plunger. Patented dual-screw thread valve attachment. Supplied in a 6-language pack (English/French/German/Italian/Dutch/Spanish). Clean all parts thoroughly after use: if other liquids (lubes etc.) are present in the injector they may contaminate sealant in future use. No risk and safety labels or warnings are required since this product is not classified as hazardous under current regulations.